@ Buzznet \\ Tokio Hotel Won Biggest Fans on MTV EMA: Yay or Nay? [14.11.14] Bill Kaulitz | Instagram: "Tapete vermelho"
It's our turn to make this Christmas Special! We have a single mug, personalized to offer you . 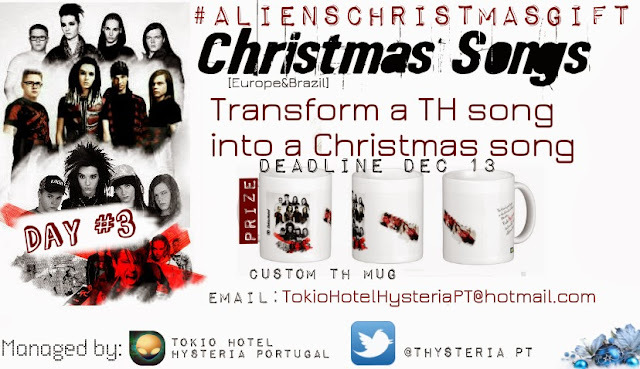 -Transform a music of Tokio Hotel on a Christmas song. You can do it in video, pictures or sending an email, try to be as creative as possible. It doesn't matter if you can't sing, you can dance in the video showing the letter in the Middle, you can make a rap using the melody of one of the songs of TH, but with Christmas lyrics . Surprise us!!!! Take your ideas out of limit and let your imagination win. You have until December 13 to send us your email. -No emails will be accepted which are not written in English, Portuguese, Spanish. -Any email, video, photo with some (any) insult will be eliminated.